Dawood Masood, 22, headteacher and imam at Al-Hira Centre in Luton, and chaplain at Luton & Dunstable hospital. Photographed in his back garden in October 2017. “When ISIS emerged in 2014, my friends and I wanted to raise our voices, to make sure people didn’t think this represented Islam. 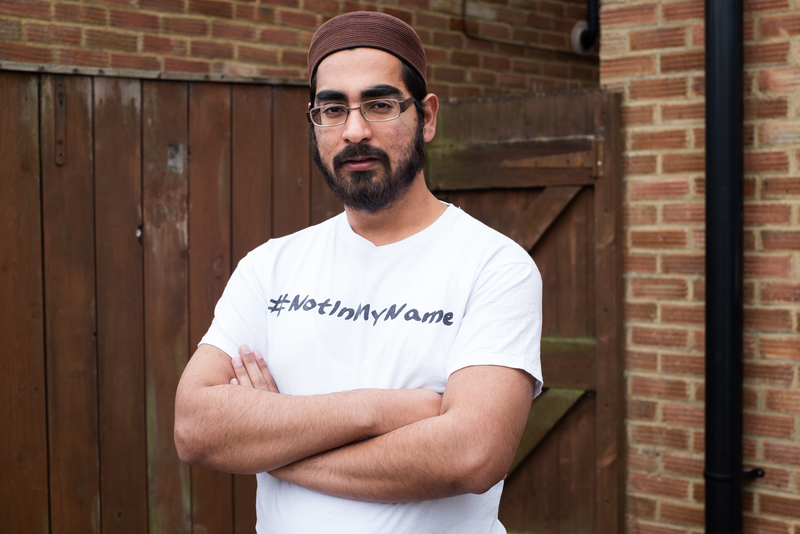 So we made these t-shirts, with the hashtag #NotInMyName, and I tweeted a photo of us wearing them. It went viral. I think whenever there’s divisive rhetoric then it’s important to build bridges. I went on an imams’ delegation to Paris after the 2016 terror attacks, and a group of us recently did a campaign in Luton where we gave out roses to non-Muslims. But I also think there’s sometimes an unfair pressure on the Muslim community. Integration is two-way. It’s not about just putting one religion on the spot. I often see an identity crisis in young Muslims. For kids whose parents came to the UK as economic migrants, this is the only country they know – they might be of Pakistani heritage but they’ve never been there. And then far-right groups and the media tell them they don’t belong in this country and they’re not integrated. So are they British or Pakistani? Neither?